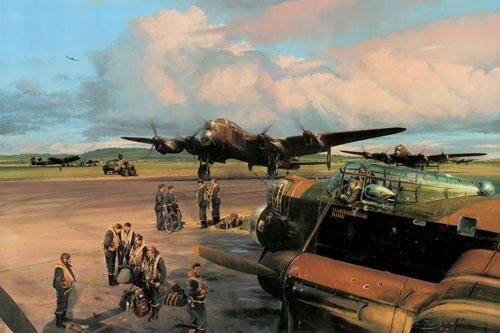 Overall Print Size 30" x 23"
The mighty Lancaster, the mainstay of RAF Bomber Command, crewed by volunteers from Britain, Australia, Canada, New Zealand, Rhodesia, South Africa, and many other nations opposed to Nazi rule, flew day and night sorties whenever there was a chance of reaching the target. Their unflinching courage, and selfless devotion to duty paved the way for the D-Day invasion, and the ultimate liberation of Nazi occupied Europe. Embellished with Goering's infamous quotation "No Enemy Plane Will Fly Over The Reich Territory", S for Sugar took her bombs to Berlin, Hamburg, Schweinfurt, Bremen, Hanover, Wurzburg, Munich, Stuttgart, Frankfurt, Dusseldorf, and other prime targets, flying the second greatest number of operational sorties of any bomber in the Command. Time and again Sugar brought her crew home, often limping back riddled with flak and bullet holes, occasionally on three engines, and once all the way back from the German capital with a badly damaged wing following a mid-air collision over the target. Robert Taylor's emotive new painting shows S for Sugar on the morning of 27th April, 1944 after her 95th sortie - a raid on the ball-bearing factory at Schweinfurt. As the battle-scarred bomber taxies in at RAF Waddington, other 467 Squadron Lancasters follow, heading for their dispersal points. Already the weary crews begin their informal debriefing. By the war's end this trusty bomber had completed no fewer than 137 operations over enemy territory, bringing her crew home every time. Now magnificently restored to her former glory, S for Sugar resides in the RAF Museum at Hendon, providing a lasting tribute to the gallant men of RAF Bomber Command. ne famous aircraft was typical of, and ultimately came to symbolise, the men and machines of Royal Air Force Bomber Command. Flying initially with 83 Squadron Pathfinder Force, then 467 Squadron RAAF, Avro Lancaster serial number R5868, call sign S for Sugar, took part in almost every major attack on Germany between the summer of 1942 and the end of hostilities. With the life expectancy of a new Lancaster being just a few months, it was a miracle she survived the war.